Friday marks the third anniversary of Seattle and King County’s homelessness state of emergency, and a year since The Seattle Times launched Project Homeless. Here’s what the team has learned. The pleas were unambiguous: Seattle and King County leaders, three years ago, asked the state and federal governments to open their wallets up wide and offer disaster relief for the homelessness crisis, like they would after an earthquake. That didn’t happen — here, or in other West Coast cities that made similar proclamations — leaving the disaster response mostly a local problem. Yet three years into the emergency declarations, Seattle and King County have rarely acted as if they were responding to an emergency. Seattle’s proclamation gave it extraordinary authority to bypass “time-consuming procedures and formalities prescribed by ordinance, statute, rule and regulation,” but the city has used it sparingly, mostly to site tiny-house villages. King County’s Board of Health only recently suggested a typical disaster response — deploying massive tent shelters. The county and city continue to operate separate homelessness bureaucracies. 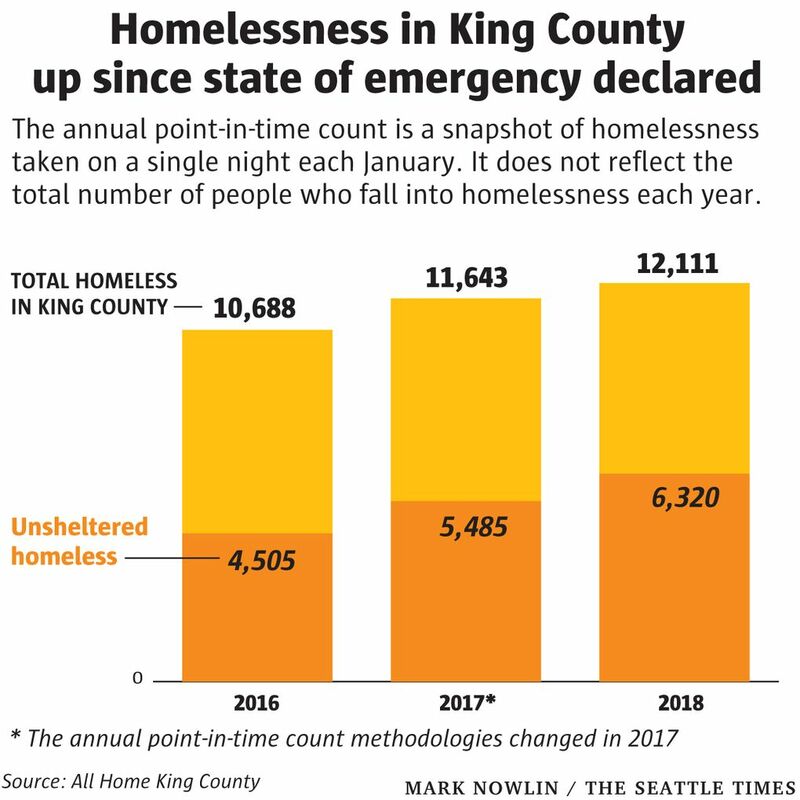 Friday marked the third anniversary of the emergency declarations, and it coincided with the first anniversary of The Seattle Times’ Project Homeless, a community-funded journalism initiative to explore the ongoing crisis of homelessness. In the first year, we’ve come to appreciate the extraordinary complexity of the problem. Homelessness is extreme poverty, and that’s a social problem America has never solved. But we’ve learned there are some potential solutions. We better understand fault lines in the government’s response. And we have questions we’re thinking about as we begin year two of Project Homeless. A 2018 report by the King County auditor laid the problem bare. Three years into the state of emergency, the regional response to a worsening homelessness crisis is divided, plodding and inefficient, still lacking a singular authority to guide it. While blunt in tone, the report’s sentiment wasn’t new. Calls to consolidate authority — which is currently spread among Seattle, King County, dozens of regional cities, and state and federal agencies — have come from many people, including paid consultants and agency leaders. Proponents argue that a regional authority could act more decisively, be held accountable and could lead to better outcomes for taxpayers and the homeless themselves. “I believe we need to make that kind of shift, where we are really consolidating authority over and oversight around homelessness,” said Mark Putnam, shortly before stepping down from his job directing the county’s homelessness coordinating agency in January. A fully unified strategy has yet to materialize, but efforts to consolidate now appear to be inching forward. Seattle and King County have already agreed to a common framework for measuring the performance of nonprofit contractors providing housing, shelter and other homelessness services. More recently, Seattle Mayor Jenny Durkan and King County Executive Dow Constantine brought together dozens of business leaders, service providers and elected officials to discuss cooperation across industries and city borders. That effort, called One Table, produced several policy aspirations earlier this year, but little immediate impact. But in the weeks following the last meeting, Durkan and Constantine signed an agreement to explore options for a more consolidated system. “This new approach to regional governance will ensure our investments are yielding the best outcomes,” Durkan said. Creating a true regional authority may prove to be an uphill battle. To merge homeless services, Seattle and King County would have to coordinate across geographic and political boundaries with dozens of municipalities, each with its own budget and elected officials whose vision for combating the homelessness crisis may differ fundamentally from Constantine and Durkan’s, or their councils’. Authorities at King County and Seattle say the effort is on its way, with officials looking to Los Angeles as an example. An initial report is due to Durkan and Constantine in December. For the last three years, Seattle and King County have split their spending on homelessness between immediate responses, like emergency and winter shelters, and longer-term solutions. Emergency shelters are local governments’ second-largest budget item when it comes to homelessness, behind permanent housing. Yet governments didn’t know how much they collectively spent on day-to-day operations until The Seattle Times tallied up a price tag: at least $195 million a year in King County. And there is still no clear idea how much money it will take to fix the problem — largely because leaders don’t have a consensus on what the most critical fix is. Is it getting everyone out of Seattle’s ubiquitous tent camps and inside? King County shelters for single adults are more than 90 percent full on any given night, and families are routinely turned away. Seattle’s Navigation Team, which conducts outreach to unauthorized tent camps, is a fraction of the size of San Francisco’s; in the first half of 2018, the Seattle team had between four and 12 beds a day to offer, effectively limiting their ability get people inside. Is it building enough affordable housing to put Seattle rents within reach of homeless people? If so, King County governments would need to double their current investment in affordable housing, to over $400 million a year, according the consulting firm McKinsey & Company. Kira Zylstra, Putnam’s successor at King County’s coordinating agency, told The Seattle Times that it is the best cost estimate so far for fixing homelessness. Seattle’s proposed business “head tax” would have provided some of that, but it was quickly repealed amid political backlash. But even “Housing First” advocates agree that housing is just the start. Nearly half of King County’s homeless people said they had a mental-health problem that hindered their getting housing, holding a job or taking care of themselves. A third said they struggled with substance abuse, according to one survey. Meanwhile, the state’s mental-health system has been struggling for years with a lack of funding. The one thing that appears to be improving is opioid addiction treatment: Overdose deaths have started to decrease, and federal funding from the Obama and Trump administrations has increased access to treatment. This year’s one-night census of King County’s homeless population revealed a startling 46 percent increase in the number of people living in their vehicles. Now more homeless people here are bunking in vehicles than in tents or on the streets. Yet there are few resources specifically for the more than 3,300 people who live in cars and RVs on any given night. They can be harder to reach and more reluctant to accept services than are people living in tents. “Their main goal a lot of times is to keep the one possession they have, which is their vehicle,” said Tracy Gillespie, with the Law Enforcement Assisted Diversion (LEAD) program. And, because vehicle residents have some semblance of shelter, their needs are often very easy for officials to ignore. No one group is in charge of outreach to them. Seattle’s Navigation Team is focused on people living in tents, not vehicles. The city’s expanded LEAD program now has case managers in North Seattle, but it only works with people who are in trouble with police. An effort called the Scofflaw Mitigation Project helps people who may lose their vehicle to impound if they have too many parking tickets, but it is run entirely by volunteers. Meanwhile, consistent complaints about unwanted consequences related to vehicle camping — everything from trash dumps to alleged criminal activity operating out of vehicles, particularly RVs — helped spur Seattle Public Utilities to conduct targeted cleanups along streets that are de facto vehicle camps. Outreach is done before cleanups, but there are no guarantees of shelter. Vehicles still on the street on cleanup day are towed. Seattle and King County are slowly working to get their arms around the problem. Mayor Jenny Durkan wants to set up an overnight-only safe lot, at a location to be determined, modeled after programs in California that were featured in The Seattle Times. The lot would not serve people living in RVs, even though most of the county’s vehicle dwellers live in them. And the city’s previous track record on safe lots is weak: The last such effort has dwindled to a forlorn lot in the Sodo industrial district with only a handful of vehicles left. King County, responding to the growth of homelessness countywide, is looking at the problem outside of Seattle, with mobile outreach staff as well as case-management and housing services to support faith-based groups that host vehicle campers on their properties. If the current trends continue, focusing on vehicle campers will be crucial if governments stand any chance of significantly reducing street homelessness. New, permanent, affordable housing is expensive — $350,000 or more per unit, through a mix of public and private money. As Seattle and King County seek to move thousands of people off the streets, out of shelters and into housing — even temporarily — they’ve looked for cost-effective alternatives. Seattle’s tiny-house villages, costing $2,100 per unit to build, are being replicated around the region and country, even as the city refines a sometimes-faulty management model. King County is moving into modular housing, buying enough prefabricated single and dormitory-style units to house 200 people, at a cost of $12 million. It is also far faster, coming online in months, not years. Seattle has yet to make a similar investment. When someone decides to get help for their addiction or mental illness, there can be a small window of opportunity — especially if they’re homeless. But in King County, waiting times can be a week, or even a month, for an appointment to begin treatment. A $1.4 million grant from King County, with added help from billionaires Steve and Connie Ballmer, has sought to shorten the waiting time for outpatient treatment at mental-health and addiction clinics. Now, more than half of King County’s contracted providers routinely offer same-day appointments — effectively, treatment on demand. 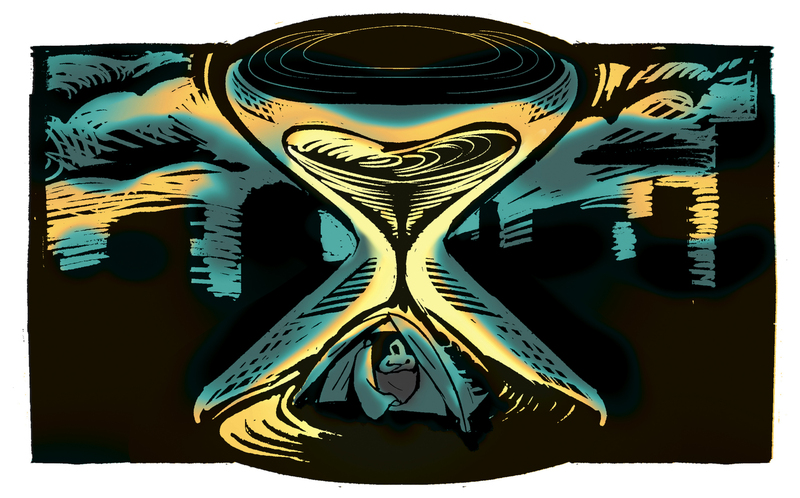 What if a solution was simply to prevent people from remaining homeless for too long? Pierce County invested heavily in a strategy called diversion, which provides one-time money — for things like an apartment deposit, car repair or even a plane ticket back to their home city — to help get people off the streets. This year, King County opened a $1 million diversion fund, available to homeless-service organizations to help their clients. Some experts warn that diversion’s reach may be limited to higher-functioning people. But diversion has shown to be more efficient than emergency shelters at getting people into stable housing — and at roughly a sixth of the cost. The seven Seattle City Council seats representing districts are up for election in November 2019, but campaigns will likely start early in the year, and will likely be contested. Will residents’ frustrations with the omnipresence of homeless encampments across the city open the door to candidates who want to take a tougher approach? King County’s homelessness crisis is concentrated in Seattle. Still, while most of the services are in the city, homelessness is not a Seattle problem alone. What are regional cities willing to do to address what is acknowledged as a regional problem? When Seattle retreated from taxing businesses to fund homelessness services, it highlighted the political limitations of government to solve the crisis. What is the role — or duty — of the business and philanthropic communities in addressing the region’s homelessness problem? We’ll be digging into these and other questions in Year 2 of Project Homeless.